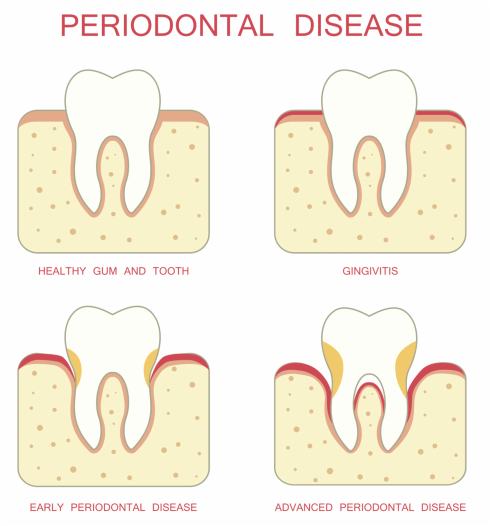 ​Periodontal (gum) disease affects both the soft tissue of the gums and the bone beneath them. Gum disease is quite common, and is a leading cause of tooth loss in adults.. The typical symptoms of gum disease are receding gums, redness, swollen gums, bleeding from brushing or flossing, or a “loose” or shifting feeling in your teeth. Yet these symptoms may not show up for every patient, even in the late stages. At Creedmoor Family Dentistry, we can identify the symptoms of gum disease during your check-ups and cleanings and provide treatments based on the level of risk to your health and need. Preventing gum disease starts with good oral hygiene. Brushing twice each daily and flossing every day can help keep your teeth healthy. We can recommend products that will help you clean your teeth and gums more effectively. If you have mild to moderate gum disease, Dr. Willis will create a plan for treatment that may include a deep cleaning procedure called root planing and scaling. This can take place over several months to produce the desired effect. More serious cases may call for surgery. If you haven’t had a checkup or cleaning in over a year, give us a call today to schedule an appointment. We understand that our patients are sometimes busy and forget to come in for regular appointments. Our office is friendly and comfortable, and we’ll do whatever we can to help.